Once the ticket is received by the Call Center, an auto reply email with ticket no. will be send and then will be transferred to respective service provider to process the request. For Residents: Specify dorm / house / building and unit number: followed by Request details. Ex: Dorm P–206A: Water leakage in kitchen sink. For Others: Specify building name / office area and room number: followed by request details. Step 4: Provide accurate information of the name if the building / room / unit number, telephone and email. These information are necessary in order for our team to contact/coordinate with the requester. Step-5: Click create and then a work request will be created. An auto reply e-mail with ticket number will be sent to the e-mail provided. When following up a request, please always refer to your ticket number. 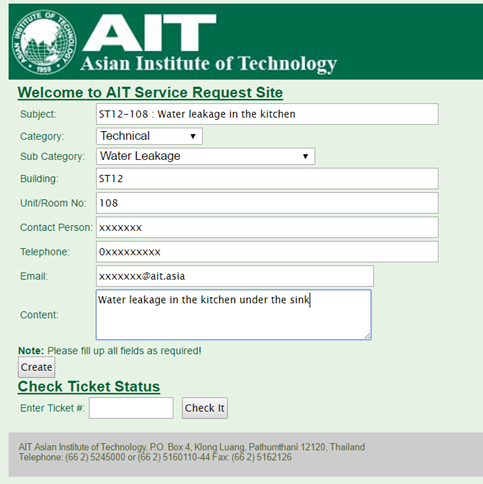 Note : To create a request with an attachment (Ex: Picture of location) please send an email with attachment to callcenter@ait.asia.